Item Detail - CAPTAIN MIDNIGHT'S MYSTIC SUN GOD CLASSIC PREMIUM RING HIGH GRADE EXAMPLE. This 1946 Ovaltine premium has adjustable brass bands and a base which pictures elaborate Aztec designs. 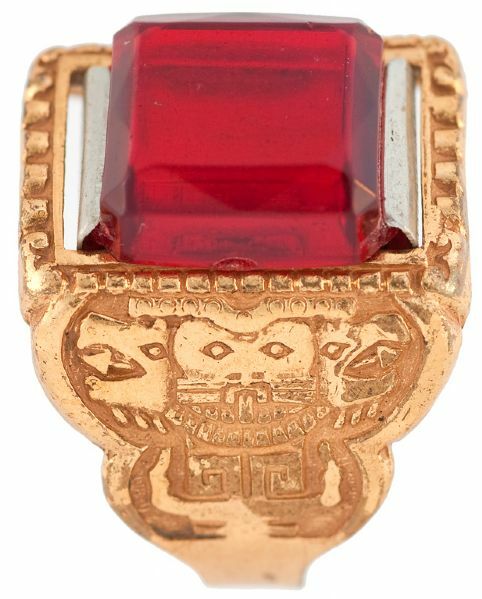 Top has small metal clip on the underside which holds a deep ruby red beveled plastic stone which slides off and has hollow interior for secret messages. This ring is essentially Mint like the day it was made and is extremely rare in this condition. This is among the scarcest premium rings as kids quickly lost the removable plastic stone top. A gorgeous essentially Mint example of the dozen or so I've owned in five decades, this is the one I kept for the Ted Hake Collection.